Thanks in advance for your help. I might be over thinking this, but I'd rather be safe than sorry. 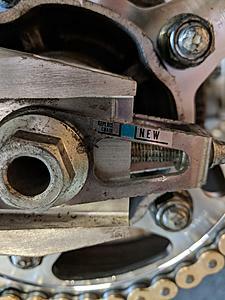 I decided replace my sprockets and chain with this exact 16/43 set. After it was all said and done, I stretched the chain and the rear tire is so far out that the chain indicator already indicates that the chain needs to be replaced (see picture). Obviously it doesn't, but is the tire being this far out already a problem? Do I need to remove one of the links in the chain to bring the tire back in? Looks like taking a link maybe even two might get you where you need to be. Count the links. You should have 102 if using a 530 chain. It's a 104. I'm assuming since the rear spoke is larger than stock. I put a 43t on my VTR a while back and didn't need to add links. You need to have 2 removed. Any local shop would be able to do this in 5 minutes or less. What I been up to sadly not the VTR..